The poster here says it all! If you want to learn more about the growing sport of kayak fishing, this is an event you don’t want to miss. It’s Friday night from 6-8 p.m. at the Union Parish Library in Farmerville with on-lake demos on Saturday from 11a.m.-1 p.m at Lester’s on the Lake. Want to break kids in to fishing without a huge investment? Look to kayak fishing. There are lots of great kayak fishing spots in Union Parish and our area. 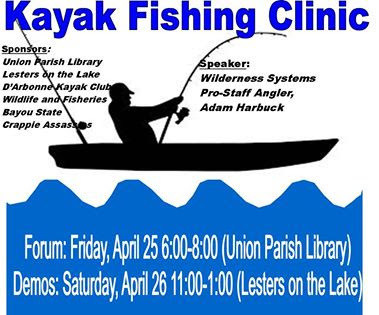 Thanks to the sponsors — Union Parish Library, Lester’s on the Lake, D’Arbonne Kayak Club, LDWF and the Bayou State Crappie Assassins.